Since 2012, JNR Home Improvements Inc. has been the outdoor living experts servicing Santa Clarita and the Antelope Valley with a focus on designing and building low maintenance outdoor living spaces. JNR Home Improvements experts can design and build custom patio covers, awnings, sunrooms, lattice and pergola structures to create the ultimate outdoor living space. They offer solid insulated patio covers as well as solar ready patio covers. Their patio covers are engineered to meet the winds associated with Santa Clarita and the Antelope Valley as well as snow loads associated with Tehachapi and Wrightwood. When it comes to engineering, JNR Home Improvements take great pride in understanding these unique weather conditions. Want to enjoy your outdoor living space without having to maintain it and have great curb appeal? JNR Home Improvements can transform your front yard into a beautiful drought tolerant landscape, that will not only lower your watering bill, but also help to conserve water. Another low maintenance outdoor living space can be created by installing EasyTurf artificial grass, which is a true pet-friendly grass, allowing you to have a dog, a great lawn and an overall great family-friendly experience. JNR Home Improvements can also transform your backyard into a professional style home putting green or family putt-putt golf course. Their experts will custom design an ultra-realistic professional grade home putting green with subtle undulations, breaks and bunkers while utilizing professional grade golf cups and flags that will be the envy of the neighborhood. High quality, energy efficient replacement windows are another offering from JNR Home Improvements. Being a direct dealer means that JNR cuts out the middleman allowing for unbelievable pricing. Keep your home cooler in the summer and warmer in the winter with beautiful window replacements that look great. Recognized as one of the “Best Entrepreneurial Companies in America” by Entrepreneur magazine’s Entrepreneur360™ List, JNR Home Improvements is the outdoor living experts that are located right in your own backyard. Santa Clarita and Antelope Valley residents can take comfort in knowing that JNR Home Improvements is an insured and bonded California general building contractor that will take care of the whole process from start to finish. They will also obtain all necessary building permits and schedule city inspections so that you don’t have to worry about the little things. LA Table Pad Company is a family-owned company located in the Santa Clarita Valley. They offer top quality table pads, custom made for your dining room table. Each table pad comes from the factory with a lifetime guarantee. No matter what happens, LA Table Pad Company will repair, reupholster, or replace your table pad for free. Their prices are also lower than any company that comes out and measure your table. LA Table Pad will personally come in to measure your table and beat any price offered by anyone in LA County. The surface of your dining room table is threatened by the perils of everyday life. Any fine or simulated wood top can be easily damaged from setting down a sweating glass, to accidentally dropping an object. The only reliable way to protect your furniture investment is a custom made table pad. Not only will a table pad protect your tabletop, a table pad also acts as a cushion to absorb sound when dining. LA Table Pad Company is the exclusive L.A. distributor of Berger’s table pads, which are manufactured with the highest quality rating in the industry and without complaints. Berger’s table pad has been around for almost a hundred years and is one of the few items that is essentially made the same today as it was fifty years ago. LA Table Pad Company’s greatest claim to table pad fame is MagnaLoc, their patented magnetic locking system. This unique table-pad innovation holds sections together and prevents slipping and sliding. Unlike any other locking device, MagnaLoc is 100% user-friendly, totally hidden, and secured beneath a protective cloth surface. That means MagnaLoc won’t scratch your table like other locking systems can! All table pads made by LA Table Pad Company are custom made for your table. Each table pad is hand-tailored to fit your dining room table top exactly and has a heavy-duty, washable, vinyl leatherette surface, along with a cushiony velvet or cotton bottom and folds for easy handling and storage. Custom-sized tablecloths are available at LA Table Top Company for any occasion. So stop in at LA Table Pad Company in Santa Clarita today to find out how you can protect your tabletop and extend the life and value of your furniture. To learn more about LA Table Pad Company, click here. Pacific Outdoor Living was founded to bring all elements of outdoor living under one roof. They provide all of the necessary products for outdoor living including built-in barbeques and outdoor kitchens, swimming pools, decks, patios, and outdoor ponds, waterfalls and streams. Pacific Outdoor Living specializes in the complete landscape design and installation of outdoor products in California, including the Santa Clarita Valley. They pride themselves to provide everything one needs for outdoor living under one roof. Pacific Outdoor Living is owned by Terry Morrill and his sons Trent and Chad. Terry has been a general contractor for over 35 years and has a degree in architecture from the University of California in San Luis Obispo. Pacific Outdoor Living is the parent company of Pacific Pavingstone, California Waterscapes, Jacks Turf, and Pacific Outdoor Pro Division located in Sun Valley, CA. 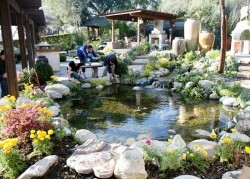 Pacific Outdoor Living can help you build the landscape design that you had always dreamed of. Their designers are trained to not only beautify design your landscape, but also to personally construct the project. They can create you a spectacular landscape on any budget. With so many designs to choose from, there are endless possibilities. Any of these features can be built as part of the landscape design or a stand-alone project. For outdoor living inspiration and advice, visit the Pacific Outdoor Living Design Center in La Crescenta, CA. They carry a large selection of outdoor accessories, pond supplies, aquatic plants, and pottery to help beautify your yard and patio. The Design Center also features many outdoor exhibits, such as waterfalls, ponds, and streams that you can sample. Pacific Outdoor Living proudly offers their services to Southern California including the Santa Clarita Valley. Call and schedule your appointment today! To learn more about Pacific Outdoor Living, click here.